Yes, that is correct, I did say a mystical, some might say magical hot water heater. It all started several years ago onboard our Mariner 40 sailboat Sea Trek. Our 6 or 7 year old hot water heater had developed a leak which we could not stop so we ordered a replacement of the exact same model and configuration, not wanting to re-plumb and rewire everything. 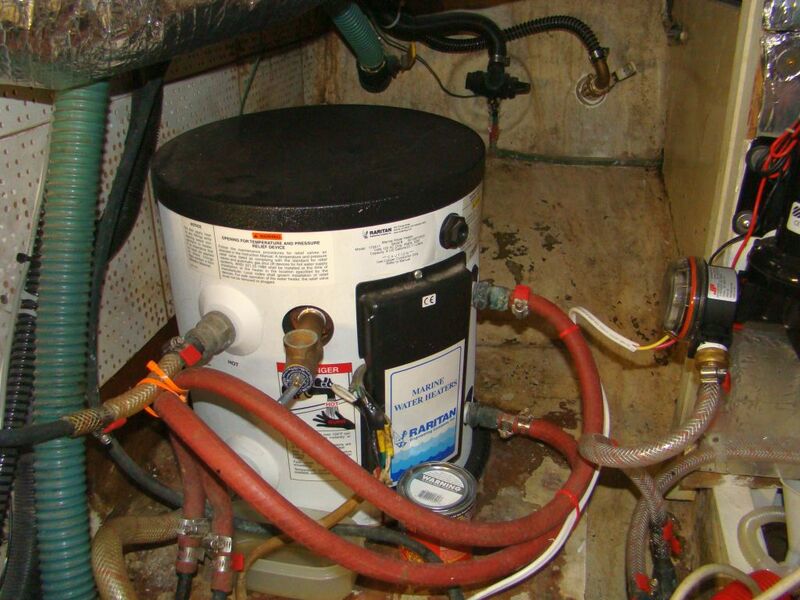 On the day the replacement arrived, the existing hot water heater stopped leaking and is still in the boat, working fine several years later after we sold her last year. Just a few months ago on our trip up the ICW from Beaufort, South Carolina to the Chesapeake, we stopped in Southport so Susan could rent a car and drive to Maryland for a job interview. While at the marina in Southport, I discovered the existing hot water heater in Beach House was leaking and the tank was pretty rusted on the outside. The magical hot water heater that we have been carrying around for several years was in the back of our van, at a friend's house in Maryland, waiting for us to arrive. I called Susan and asked her to stop by the van and pick up the water heater since I feared the one on Beach House might fail on us along the way. Since we had this as a spare, it should be with us on the boat. Well sure enough, as soon as she returned to the boat with this water heater, the old unit immediately stopped leaking without us even touching it. We finished the trip to the Chesapeake and after a month or more the water heater still showed no signs of leaking. When Is Towing a Boat, Not "Towing" a Boat? Today’s recreational boater is as likely to leave the dock with a paid towing insurance policy on hand as they would a VHF radio. 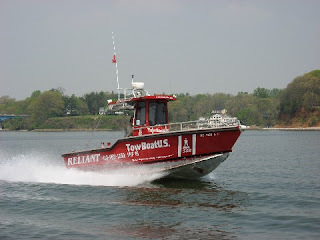 The commercial towing industry for recreational boating is big business today and many boaters, in an attempt to defray significant expenses should they need assistance, are looking to companies like Towboat US and Sea Tow to come to the rescue if they need it. But do you really know what is covered, what is not and what your responsibilities will be in these “rescues”? Many of these policies have different levels of coverage and deductibles, just as your auto or home owners insurance might. It is to your benefit to ask questions before you buy these policies, read them carefully and have all of your questions answered long before you might need the service. Not all policies are the same and in the end they can be a savior or they can cost you or your insurance company a substantial sum.